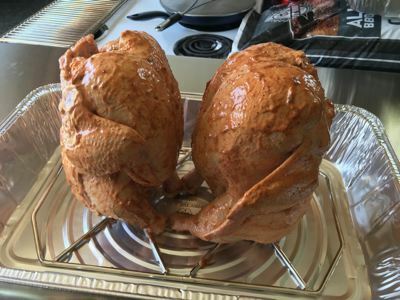 Beer can chicken (or root beer chicken if you prefer) is one of those things that people love to do in the smoker or grill and while the science seems to indicate that the liquid isn’t all that important, it’s super cool and as you know, presentation and aesthetics plays a big part in the meal. I’ve been doing these for years, my family and friends love them and that’s enough science for me. I’m a big fan of brining poultry which is just soaking it in some salty water for a few hours. During this time some of the salt and water is drawn into the fibers of the meat and you can really taste the difference in the finished product. Brined poultry also tends to end up being more juicy non-brined poultry– supposedly some of the brine is drawn into the meat and gets locked in during this process. Sounds good in theory and I can’t personally prove this is what happens but the result is fantastic and therefore I continue to do this anytime I cook chicken. Add the salt and sugar to the water and stir until all is dissolved and the liquid is a clear amber color. 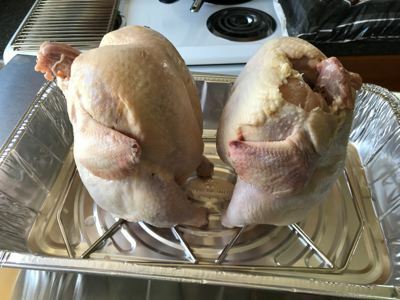 Place the chicken(s) in a plastic, glass or stainless steel container and pour the brine mixture over them to cover. If you need more brine, just mix a 2nd batch. Place the container in the fridge during the brining process. Some examples of acceptable containers would be zip top bags, stainless steel stock pot, plastic or glass food storage containers. NO aluminum. Note: This is not a cure and does not render the meat invincible to germs and bacteria. It is for flavor and juiciness only. Leave the chickens in the brine for about 4 hours or 1 hour per pound. I would not brine them longer than this or they could end up being too salty and/or the texture of the meat can be affected. Rinse the chickens when they are finished to remove any excess salt from the outside and they are ready to proceed with the process. What if the chickens are already brined with a solution from the store? Have you ever tasted a chicken from the store that was even the least bit salty? Yeah, me neither. The process that they do in the factory is severely inferior to what you can do at home in my opinion. I brine nearly all poultry that cooke even if it’s already had some sort of solution added. Mine is better, period. Does the chicken end up being salty? No, as long a you follow the correct brine time, it will be flavorful, not salty. Salt should compliment the natural flavor of the meat not cover it up and that’s what brining does. 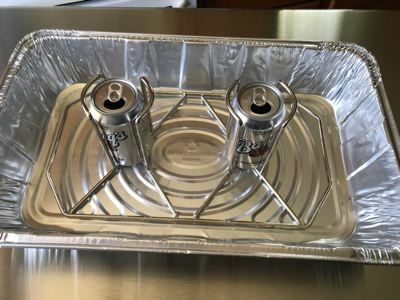 You don’t need a fancy holding device for this although it is nice to have a rack that holds the cans in place. I used one for these and it made the job a little easier and I didn’t have to worry about the chickens falling over. Open the cans of root beer or whatever you are using and drink about half of it. Lower the cavity of the chickens over the top of the cans with the legs supporting some of the weight. Now with the chickens in place on the cans, they are ready to be seasoned on the outside. We are using the original rub on these simply because there is nothing better on chicken in my opinion. My original rub recipe is low on salt, big on flavor and it creates a wonderful crust on almost anything. I often apply the rub directly to the skin of the chicken but on these, I decided to mix the rub with mayonnaise and apply that all over. 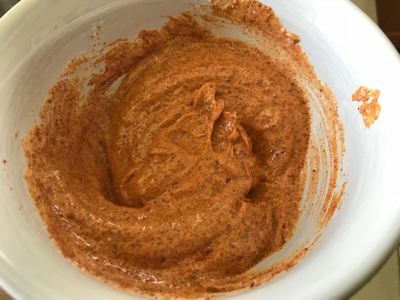 Mayo is an excellent base for the seasoning since it’s essentially oil and egg. 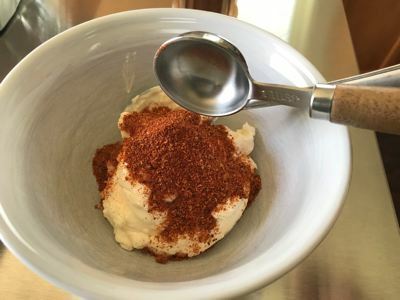 1 cup of mayonnaise and 3 tablespoons of Jeff’s original rub should be mixed together in a bowl. Make sure the chickens are dry then use your hands to rub the rub/mayo mixture all over the legs, wings, breast, back and sides of the chicken. Be generous with it. Anytime you have need of versatility such as mixed temperature during a cook, look no further than a pellet grill. This type of cooker can usually cook at low temperature, fairly high temperatures and everywhere in-between. The lower the temperature, the more smoke flavor you will have so while they are versatile, I recommend some slow smoke time before cranking up the heat. That was just the method I used for these beer can chickens on the Camp Chef pellet grill and it did not disappoint. I’ve been using the Woodwind for a while and just got the SG (slide and grill) a while back. I have not tested the slide and grill option yet which allows you to move the heat deflector to the side during the cooking process to allow the flames to come up and sear the bottom of the meat. I really like the side searbox on the Woodwind so the SG has some big shoes to fill and I look forward to trying that out soon to see how it compares. In all other smokers and grills, preheat to 275°F or as close to that as possible and leave it there throughout the entire cook. Once it’s ready, the chickens can be placed on the grate. You will notice that I placed the chickens down in a foil pan. This is to keep the smoker clean by catching the drippings instead of letting them fall down into the smoker. Not only does the smoke get down in the pan just fine, the position of the chickens over the cans holds them up high so they get plenty of access to the smoke and the heat. 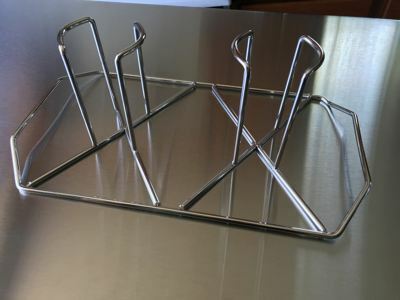 If you have a smoker with multiple racks, you could also place a pan on a lower grate. You can place it right on the grate if you prefer.. you have options. In my pellet grill, I started out at 225°F and left it there for 1 hour. As I mentioned, in these cookers, the lower heat produces more smoke so I often cook in two stages, a lower heat, more smoke stage and then a higher heat, less smoke stage. I think those who complain about these pellet grills not having enough smoke flavor, may be cooking too hot right out of the gate. At lower temperatures, I get tons of smoke, great smoke rings and plenty of smoky flavor in the finished product. After 1 hour, I cranked up the heat to 275°F for about 2 hours to finish the birds and take them to 165°F internal temperature. I highly recommend using a thermometer to monitor the temperature of the meat while it cooks. My thermometer of choice was the Thermoworks “Smoke” but if you have something different that’s ok too as long as it’s accurate. The “Smoke” is a dual probe, remote meat thermometer and connects to an app on my phone via an optional Wifi gateway. 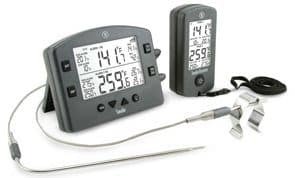 This allows me to go about my day, even go to the store or anywhere else I please and still know exactly what’s going on with the temperature of my smoker and the meat. You can also use a handheld thermometer such as the Thermapen or ThermoPop to to check the temperature when you think it’s getting close to being done. 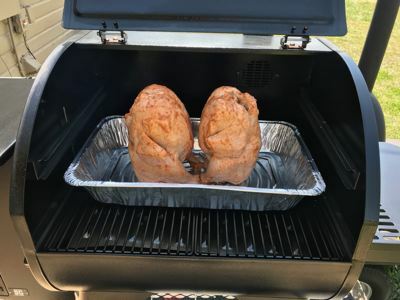 If you are using a charcoal, gas, electric or stick burner set to 275-300°F, you can expect these to get done in about 2 to 2.5 hours depending on the size of the birds and how often you open the doors/lid. Apply smoke for as much of the cooking time as possible or at least 1 hour. 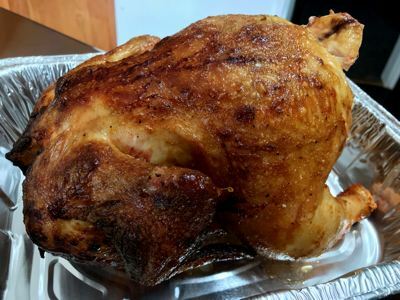 When the thickest part of the meat in the breast reaches 165°F, the chicken(s) are done and can be removed from the smoker right away and off of the cans. Tent some foil over the chicken once you bring it into the house out of the smoker and let it rest for about 10 minutes before slicing.